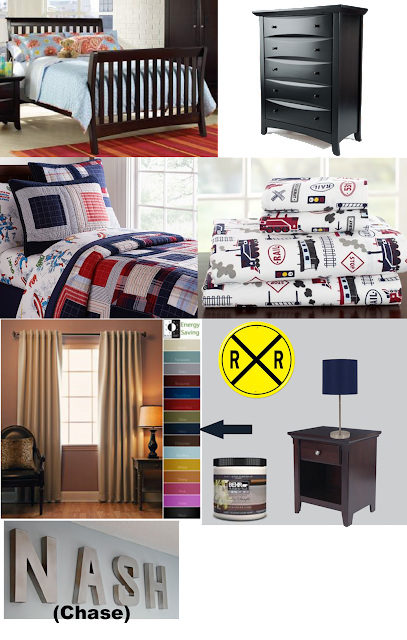 Just Another Day...: New Big Boy Room Inspiration... Help Needed! Working on some inspiration for Chase's new "big boy" bedroom. I want something train-y, but not like Thomas the Tank Engine threw up all over his walls. Right? The bed and dresser below are the furniture he already has (although the dresser is more brown and less black -- just a bad pic... and he's still in the toddler bed -- this is all about the transition to full size bed, which will take place in December). Much to my husband's dismay, today I purchased the train sheets and quilt from Pottery Barn Kids. These were NOT cheap, my friends. Major setback. But I'm pretty adamant he will be taking that quilt to college and use it for his own kids some day. I found a cute night stand and table lamp from Target, will put up some navy blackout curtains (2 floor-length panels), and paint the walls a very subtle gray. Then it's just a matter of adding in a few accent pieces of wall decor. I'm somewhat partial to the block letters I found on Pinterest that are made from cardboard letters and spray painted. I'll probably do them in blue or red to contrast with the gray walls. Then maybe add in a few train-y pieces like the RR crossing sign and whatever else I can find that I like. Thoughts? Comments? Anyone have any other ideas for awesome train decor we should include in this super cute new room? I'm such a novice at this stuff... I have no home decor skills whatsoever to speak of, so I'm very open and willing to hear any/all suggestions you lovely readers may have!